Kickstarters seem to be all the rage at the moment and, for miniatures at least, there seems to be a couple of different ways they are used. The other type of Kickstarter that I’ve had experience of is for smaller manufacturers/sculptors who need funding to bring their creations to market. I jumped on the Red Box Games Kickstarter when Tre Manor launched that earlier this year, and also Infamy Miniatures’ Indiegogo campaign when they launched their first 3 miniatures. And it is one of these that I want to talk about today. There is an Australian guy known on t’interwebs as Sprue who’s sculpting I have been watching over on OzPainters for quite some time – Tracy bought some of his metal goblins a while back, and his sculpting has really gone from strength to strength. 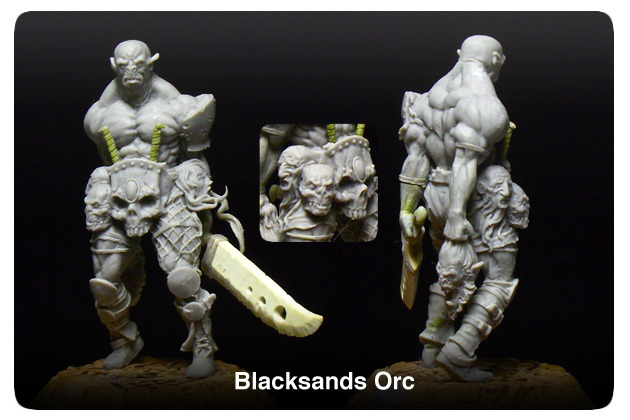 Today he has launched a Kickstarter to release 4 of his sculpts and put some funding towards his new skirmish game (which looks VERY interesting as you cast [resin] finger bones as part of the game mechanic). I highly recommend getting over to the Kickstarter and pledging some of your hard earned cash. From what I’ve already seen of his sculpting and the plastic he will be using to cast his models, I really don’t think you’ll be disappointed.